Common disturbances affecting SOC in northern high latitude. (a) Drying lakes; (b) thermokarst resulting in fens and bogs; (c) fires combust surface organic layers and have a long‐term impact on the ground thermal regime; (d) thermokarst lakes; (e) thermoerosional gullies; (f) retrogressive thaw slump associated with glacial thermokarst (photos: Grosse et al. 2011). Thermokarst and thermo-erosion are major processes of ice-rich permafrost degradation with widespread occurrence in northern high latitude permafrost zones. 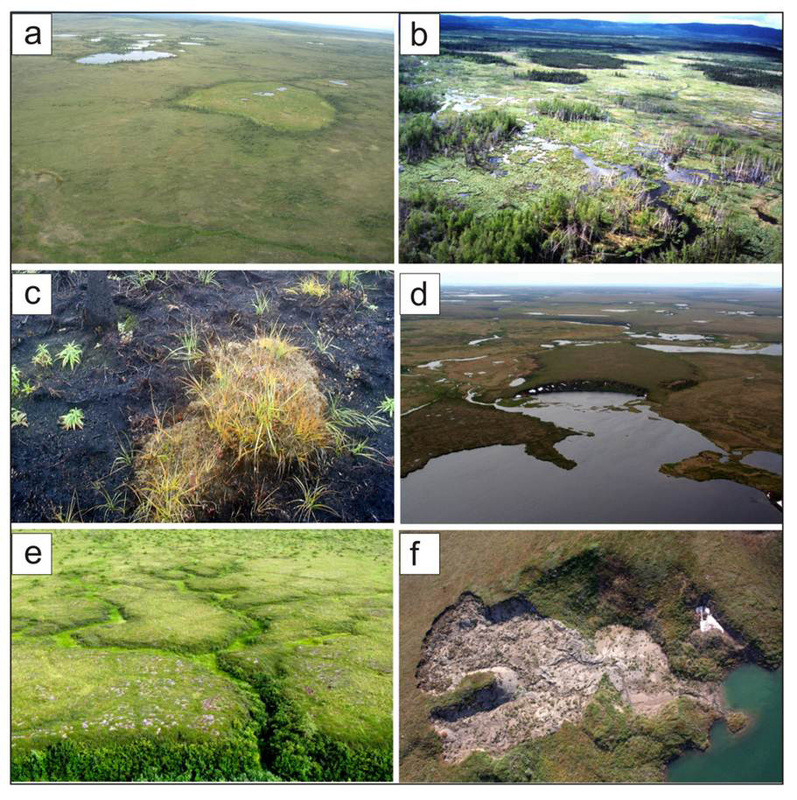 Contrary to top-down thawing of permafrost, these processes can tap rapidly into deep permafrost-stored carbon pools and result in the release of organic carbon in gaseous, particulate, and dissolved states. These rapid processes are highly variable and depending on local permafrost, hydrological, geomorphological, vegetational, climatological, and geological conditions. 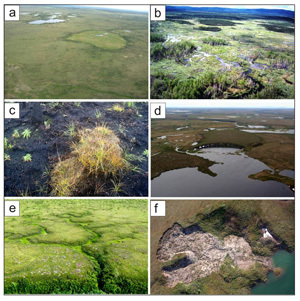 Though often small in spatial scale, they are widespread in many permafrost landscapes and can be very dynamic on time-scales ranging from weeks to decades. 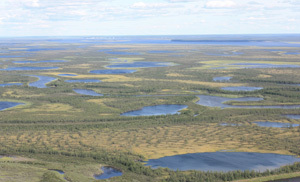 Inventories of thermokarst features currently only exist for local to regional scales resulting in difficulties to quantify their current impact on the permafrost-stored organic carbon pool. To understand the future impact of such thermokarst processes it is necessary to develop model approaches capable of capturing their spatial and temporal dynamics and impacts on C fluxes between different pools. The spatial distribution and scale of thermokarst requires the development of innovative ways for parameterization in Earth system models to effectively capture these sub-gridcell processes. 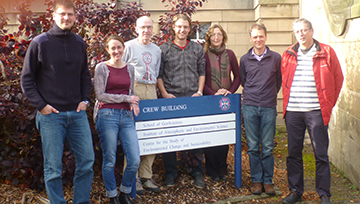 First simple assessments of future impacts could be achieved with linear projections of processes based on current inventories and process rates.